A WOUND IN TIME: The NEW "A WOUND IN TIME" IS POSTPONED! 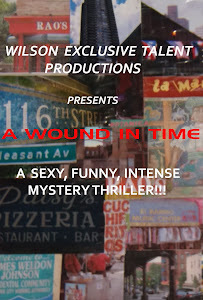 DUE TO CONDITIONS BEYOND MY CONTROL THE NEW "A WOUND IN TIME" IS BEING POSTPONED. I AM VERY GRATEFUL TO THE OPPORTUNITY TO BE A RECIPIENT OF LOOKING GLASS THEATRE'S SPACE GRANT AND THIS IS A VERY HARD DECISION BECAUSE OF THEIR GENEROSITY. I LOOK FORWARD TO EVENTUALLY REMOUNT THE PRODUCTION IN THE NOT TO DISTANT FUTURE ONCE CERTAIN ISSUES ARE RESOLVED. THANK YOU ALL FOR YOUR SUPPORT!